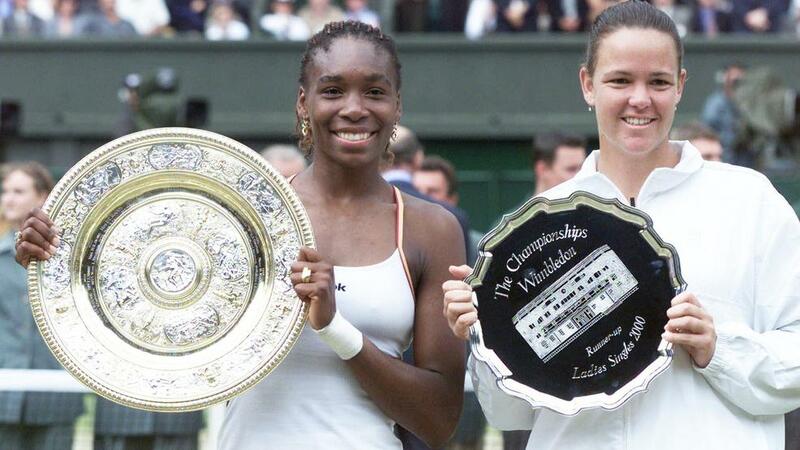 Her first Wimbledon had come in 1997, the same month she’d turned 17. So nervous was Venus Williams at her Wimbledon debut that she’d even served a ball with a broken string. But three years later, she was a seasoned warrior, primed to take the title her father and coach, Richard, had envisioned as Venus’ destiny before she was even born. As would often be the case in Venus’ career, time away from tennis proved helpful. Sidelined with tendinitis in both wrists, she had missed the first five months of 2000. Seeded fifth at Wimbledon, Venus handily made her way to the quarters. Then came a career-defining match, versus Martina Hingis, who at that point had won nine of their 13 matches. Squeaking that one out 6-4 in the third, Venus in the semis encountered emotion in a different form: a semis versus sister Serena. This one too went Venus’ way, 6-2, 7-6. In the finals she took on defending champion Lindsay Davenport. Davenport also held the lead in the rivalry – 9-3. But after a light rainfall caused a 20-minute delay, Venus was primed. “I was going to go for it,” she said after the match. “I went ahead and hit my big serve. On my groundstrokes, I didn’t start waiting for someone to miss. I just went for it whether I missed or not.” After winning the first set, 6-3, Venus served for the match at 5-4 – only to strike two double faults and drop her serve. But at 6-all, she was forceful, dropping just three points to take the biggest title in tennis. The entire Williams family was elated. Venus made her way up into the seats, embraced Serena and slapped hands with Richard. There would be four additional Wimbledon title runs for Venus Williams – and perhaps even more.